Six inch doll comes with her animal friend. Ekaterina Elephant Doll Enchantimal Six inch doll comes with her animal friend. Gillian Giraffe Doll Enchantimal Six inch doll comes with her animal friend. Tanzie Tiger Doll Enchantimal Six inch doll comes with her animal friend. Swan Enchantimal Six inch doll comes with her animal friend. Danessa Deer Enchantimal Six inch doll comes with her animal friend. Peeki Parrot Enchantimal Six inch doll comes with her animal friend. Hixby Hedgehog Enchantimal Six inch doll comes with her animal friend. Cherish Cheetah Enchantimal Six inch doll comes with her animal friend. 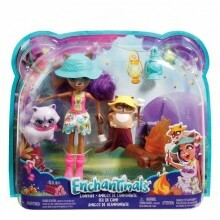 Bree Bunny Enchantimal Six inch doll comes with her animal friend. 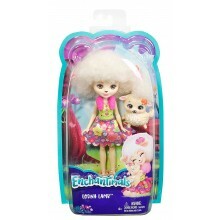 Enchantimal Six inch doll comes with her animal friend. Sage Skunk Enchantimal Six inch doll comes with her animal friend. 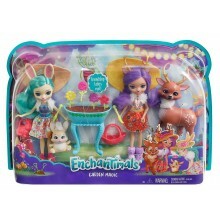 Lorna Lamb Enchantimal Six inch doll comes with her animal friend. Patter Peacock Enchantimal Six inch doll comes with her animal friend.